Dr. Louise M. Freeman is an associate professor of psychology at Mary Baldwin College in Staunton, VA. Her research interest is the field of behavioral neuroendocrinology: the effects of hormones on neural systems and behavior. She is a member of the Society for Behavioral Neuroendocrinology (www.sbn.org), the Society for Neuroscience (www.sfn.org), Faculty for Undergraduate Neuroscience (www.funfaculty.org) and the American Scientific Affiliation (www.asa3.org). She has published in journals such as Physiology and Behavior, Brain Research, Personality and Individual Differences and Evolution and Human Behavior. She is also a book review editor for Perspectives on Science and Christian Faith. 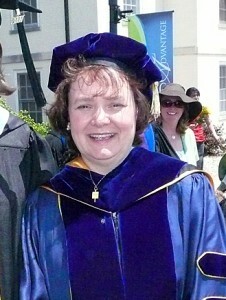 Dr. Freeman resides in Charlottesville, VA with her husband, daughter and son. Her interest in Harry Potter and Hunger Games arose from the joy of reading those series to and with her children. She can, however, trace her academic ancestry 20 generations back to Paracelsus, whose work in alchemy not only earned him a spot on the Chocolate Frog cards, but also a bust in Hogwarts somewhere between Gryffindor Tower and the Owlery.